Rottweiler breeding aims at a vigorous dog which, though powerful in general appearance, is not lacking in refinement and is particularly suitable as a companion, guard and utility dog. It is above middle size, sturdy, slightly elongated, stocky and powerfully built. The body length should exceed the height at the withers by 15% at most. That corresponds to a ratio of 10:9.1 and 10:8.7. In the case of a dog 65cm high at the withers that represents a length of 71.5 to 74.5 cm. The Rottweiler is a trotter. In motion the back remains firm and relatively still. The course of motion is harmonious, secure, powerful and unchecked with a good length of stride. 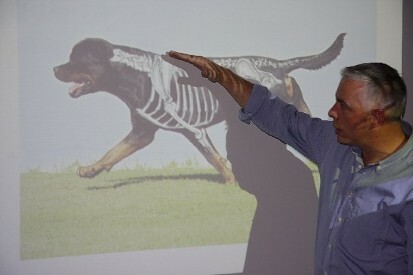 Picture left is Gerard O'Shea teaching a workshop. 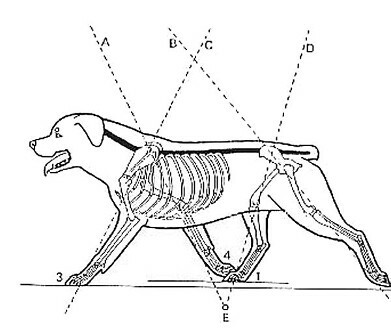 The body of the dog is adapted in its construction to forward motion, for which reason the centre of gravity of the whole body lies in the front half of the trunk. Trotting is the kind of gait in which the centre of gravity of the body is supported exclusively by diagonal pairs of limbs and these always move synchronously, ie. are approximately in the same phase at each moment in the course of motion. In trotting the trunk is propelled forward by powerful muscular contraction, whereby motion experiences considerable acceleration. In this the musculature of the trunk, and especially of the back and neck, play an essential part by tightening the spinal column, which is flexible in the dog, and taking part in the synchronous interaction of the diagonal limits. As the latter throws the centre of gravity constantly forward in a straight line, sideways swinging movements of the trunk are absent in trotting, while the back remains relatively still. Faults of appearance can blur and distort the image typical of the breed. Such faults include a general appearance which is light and lacking in substance, and a body which too long, too short or too narrow. There should not be a lack of refinement. Refinement implies in the dog, descent from forebears which rose above the average in form and working performance. A dog with refinement is also one which is beautiful, noble and proud looking. 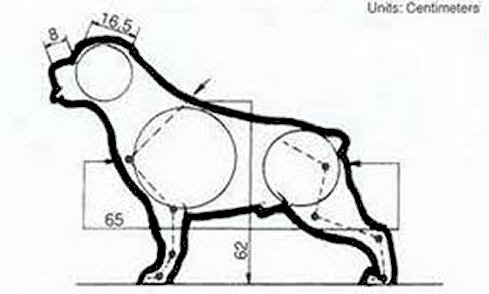 Size is not the main feature of the refined dog, but beautiful clear outlines and a harmoniously proportioned body. Refinement does not express itself only in the form, but also in posture and character. Temperament without pushiness, courage without wildness, friendliness with a touch of reserve. The results of breeding are presented at shows, and taken together, they reflect the status of the breed. Here we find that within the range of variations among the top animals, the type leans more towards the upper limit so far as substance is concerned. It is often massiveness that strikes one. Body weight approaches the limit where pleasure in work, agility, endurance and finally health as well as character attributes are unfavorably affected.